The Judy Lane at the Hampton harbor in Hampton Virginia. While the harbor now houses many large yachts, sailboats and sport fisherman, it is still home to many of the boats of working waterman. 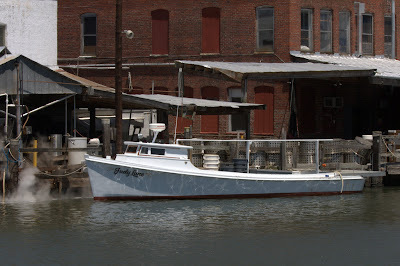 The Judy Lane is a Chesapeake deadrise workboat, for over 100 years the craft of choice for local waterman tonging for oysters, pulling in crab pots or fishing nets. While the mountain of oyster shells that once marked Hampton's waterfront is gone, commercial fishing struggles to stay alive. Canon 40D, 1/125 sec at f/18.0, ISO 100, 70mm. Pics are not that sharp-I've seen much better on the web from the Canon G10. 135 - Ice, Ice Baby!